There are a million reasons to catch San Diego Musical Theatre’s, in conjunction with the California Ballet Company (celebrating its 50th anniversary) currently running musical, “Billy Elliot, The Musical” at the Spreckels Theatre Downtown, not the least of which is a new rising star on our horizon, ten year old Charlie Garton who plays Billy Elliot. This youngster (from Del Mar Pines School) has what it takes to tug at your heartstrings yet marvel at his enormous talent as an up and coming dancer. He’s young innocent, sincere and what he does as dancer will thrill you to pieces. 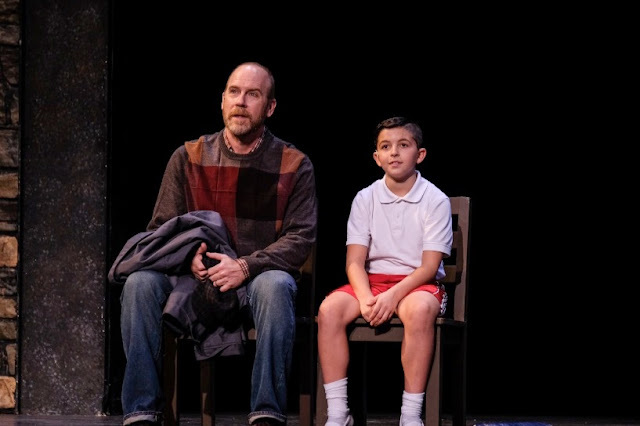 What he does with the person of Billy will make you laugh, cry and his smile, and his innocence is worth the price of admission and then some. He’s a natural. Based on Stephen Daldry’s 200 Film about a young lad from a coal-mining town in Northern England 1984 just as the coal miners in Northern England called a strike against the Government, the story is juxtaposed with young Billy Elliot’s quest to become professional dancer. It was the winner of ten Tony Awards including Best musical. With musical score by Elton John, book and lyrics by Lee Hall this production is choreographed by CBT Company Associate Artistic Director Jared Nelson and directed by former Liverpool, England resident Neil Dale, making his San Diego directorial debut. Our own locally home- grown conductor Don Le Master and his excellent 13- piece orchestra in the pit are on the mark as usual. Billy’s dad and brother are both coal miners, now out of work and ready to join a picket line. To keep Billy out of harms way, his dad sends him to the Sports Center to take boxing lessons, a sport not to Billy’s liking. Rather than staying in this class, he joins a ballet class that just happens to be using the same gym while their studio acts as the local soup kitchen. Driven more by the political unrest at the time, much of the story line concentrates on the ups and downs of the striking miners and incidentally on Billy’s struggle to overcome his father’s (Doug Tompos) and outspoken and hard headed brother Tony’s (Luke Monday) prejudices about his becoming a professional dancer. Both Tempos and Monday put in strong and emotionally charged performances. Tempos as Dad wants what will make his son happy and is torn in two by his need to make a living and let his son fly and get out from under the mines. Monday’s Tony has been a creature of the culture and is tough as nails wanting his younger brother to stay the course and carry on with the miners. The struggle continues throughout. Billy’s mother (Morgan Carberry) is recently deceased and the only female in the household is his infirm and rather eccentric Grandma (Alexandra Gonzales is a hoot) who also loved to dance. 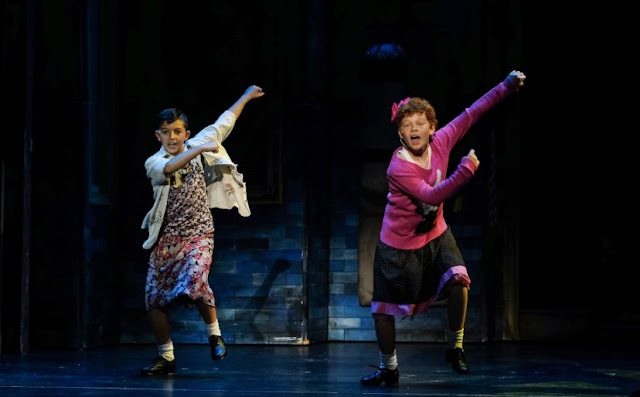 Needless to say there is about as much upheaval in the Elliot household when Billy’s enrollment in ballet is uncovered as is found at the nightly meetings in the local gym/soup kitchen. Not to be deterred however Billy’s teacher Mrs. Wilkinson encourages the boy, much to the chagrin of his Dad and brother to practice, practice, and practice. She even suggests he try out for an audition at Royal Ballet School in London. Joy Yandell plays Mrs. Wilkinson with panache and tough love no holds barred. Outspoken, caring mother figure and tough as nails Yandell is on top of her game and quite a dancer herself. She too is another reason to rush and see the show. The show has a certain appeal especially to those who love the music of Elton John (none to be hummed on the way home though) and big production numbers like “Electricity”, “Angry Dance”, “Solidarity”, “Grandma’s Dance”, “Shine”, “Express Yourself”, “Merry Christmas Margaret Thatcher”, and “We Were Born to Boogie”. The array of dance along with ballet is expansive as well with tap, and hip-hop and the gals (students) from CBC are as adorable as can be and work the system to a T.
All those ‘youngins in tutus are the cutest ever but the funniest, and we have to assume trending gay, is Billy’s friend Michael played with wondrous joy and glee by the curly red haired cross dressing Mackernan (Mac) Jarman especially when he puts one on and complains about the crotch being too tight. It’s a fun moment in another wise heavy and hard -hitting production. Another reason to see it. 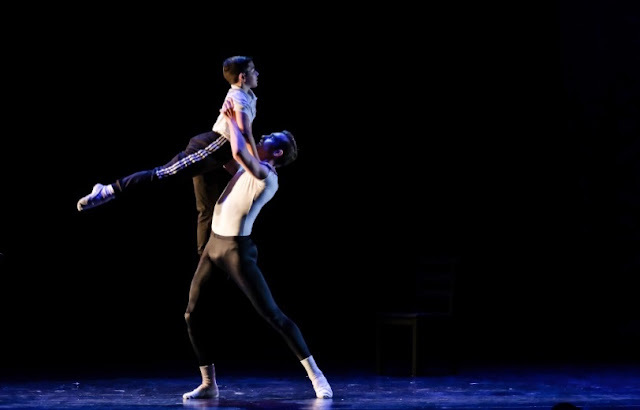 There is one big and stunning ballet a scene from “Swan Lake” featuring young Garton and California Ballet Principal dancer, a beautiful Zachary Guthier as the accomplished and older Elliot. Shivers and tears could be described as dueling feelings that raced through my body throughout that piece. Another reason to see it. This marks SDMT 11th year and as a company has produced some of the best musical theatre out city has been able to enjoy. This particular production and choice is gutsy and while it will prove to be an audience pleaser over all it does get bogged down by the thick northern England accents (I know) even with dialect coach Vanessa Dinning coaxing. Some dialogue and musical numbers were almost incomprehensible to yours truly. Overall the cast is terrific with strong voices and great dancing. There is so much in this show to see and appreciate, some necessary, some not so to cover here so as not to take anything away from your enjoyment. Excellent support comes from the extra large cast of over forty including some favorites, Ed Hollingsworth, Paul Morgavo, Amy Perkins and Debra Wanger to mention a few. 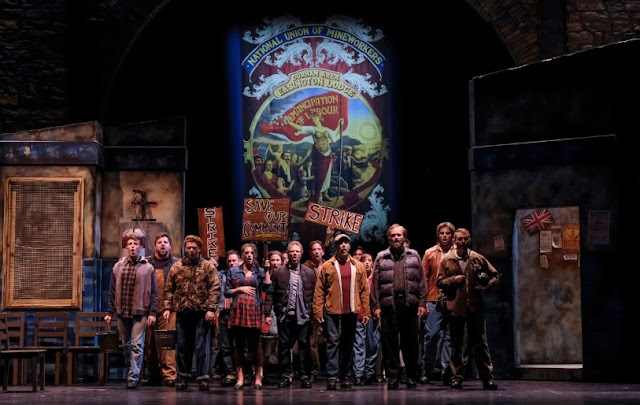 Lighting designer Christina Martin, Janet Pitcher’s costumes, Kevin Anthenill’s sound design and the multifaceted and utilitarian set design works as quick scene changes move the story along also assist in proving this to be one of SDMT's standout productions. Some of the language and gestures border on the R ratings side. Parents of younger children, who might, under ordinary circumstances love the dancing and might even relate to Billy’s struggles, should be put on notice. There are over forty reasons to see "Billy Elliot The Musical". I can't think of one not to see it.